Post-Beverly Hills Cop, Eddie Murphy could have filmed himself washing the dishes and it would have been a huge hit. Which might not have been a bad idea, since he chose to make this misconceived stinker. The 1980s may have been the actor’s peak period as a star, but it also yielded many of his weakest movies. Only Coming to America holds up out of his pictures in the last half of the decade, and that’s no classic. 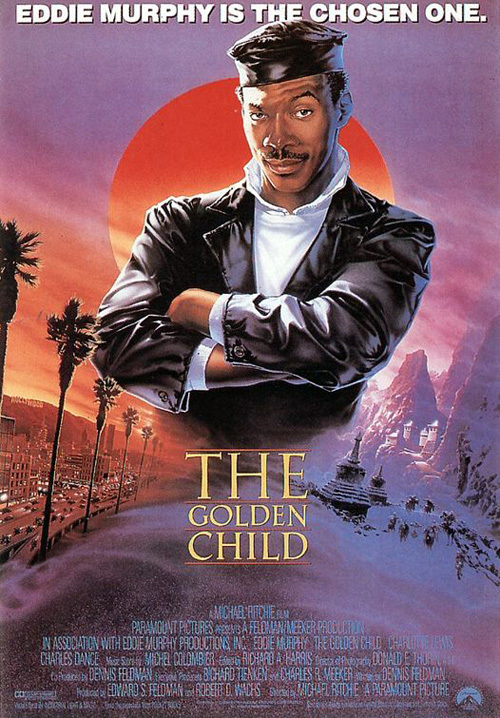 The first question that comes to mind with The Golden Child is why on earth Murphy went near it. The chance to broaden his appeal by making a PG-13 movie? But why would you neuter the cheerful vulgarity that is the key to your appeal? Shorn of his trademark crudity, a buttoned-down Murphy must coast on charisma and that laugh of his. There aren’t many guffaws for the audience, though. When you learn that this was conceived as a straight drama set to star Mel Gibson, and then reworked as an ill-fitting comedy for Murphy, things begin to make more sense. Tonally, it feels all wrong for a family movie, with missing teenagers turning up dead and child sacrifice. Murphy completely fails to convince as a social worker. He is appropriately unlikely as the Chosen One, prophesised to protect the titular child (who is the saviour of mankind). Dastardly Charles Dance has abducted and plans to kill him, don’t you know. Dance is suitably satanic, but his rent-a-British-villain act is much more fun in Last Action Hero. I guess this might have worked, with a different director and a better script. And decent special effects and a change of star. Actually, probably not. John Carpenter was originally attached to direct, so he dodged a bullet when he chose to make the wonderful Big Trouble in Little China instead (which bombed at the box office but was also replete with Chinese mysticism). Curiously, both films share several cast members; James Hong, Victor Wong and Peter Kwong. Michael Ritchie came onboard, an erratic director who was responsible for the effective political satire The Candidate during the ‘70s but increasingly settled into a pattern of making broad comedies with dubious production values (1980’s The Island is an exception and something of an oddity, with Michael Caine menaced by modern day pirates). He gave Chevy Chase had a big hit with Fletch the previous year, and his first of two 1986 releases was the modestly successful Goldie Hawn American football comedy Wildcats. Both of those look like finely honed masterpieces compared to the shoddy work here. The pacing is poor, the action clumsy, the score intrusively tone deaf (Michel Colombier replaced John Barry; presumably the latter’s work was too good for a film of this crappy), the special effects lousy (and really poorly integrated). It looks consistently cheap and tacky, with garish lighting, sets that look like sets, and ludicrously over-used dry ice. In addition, the treatment of Charlotte Lewis is shamelessly sexist in the way only really trashy ‘80s movies can be; at one point she is drenched with water and spends the rest of the scene cavorting in a see-through wet t-shirt. Murphy occasionally ekes out a chuckle or two, addressing Dance’s Sardo Numspa as Brother Numsie. There’s also a half-decent dream sequence. But the funniest moments are all Wong’s. He looks like he’s having a great time as a vulgar priest, belching away and picking his nose. But there is precious little inspired lunacy on display, and there are very few thrills. Instead, a pervading unpleasant undertone informs the proceedings. Perhaps Murphy was looking for a supernatural hit to rival Ghostbusters (Dan Aykroyd wrote Winston with Murphy in mind); what he got may have been one of the top ten films of 1986, but in every other respect it’s a failure.